The satellite is working. Finally! More than three weeks from the initial install date. I had to uninstall the software, remove some registry entries, and go through the complete software install from scratch. Everything worked this time. The problems we had were a bad upper control board on the dish and a bad receive modem from Hughes. Part of the reason the whole process took so long was due to the holiday season. Chris is working with it right now. We did some speed tests to compare with the wifi here at Paradise Island. Wifi has higher speeds, especially uploads. But we knew that. We are moving the coach tomorrow for New Year's open house at Easterlin Park. Happy New Year! The day after Christmas we picked up Debbie (Jim's sister) and Bob (her husband) to take them on a 4-day RV trip to northern Florida. They wanted to go to Amelia Island that is just north of Jacksonville, so I looked at a map (one of my favorite things to do!) researched campgrounds that would work. Blue Springs State Park looked like a good day's drive for the first night. I made reservations on www.reserveamerica.com - a really good-working website for campground reservations. We got there just before sunset. They were turning away dozens of visitors ... a very popular place. Blue Springs is known for its manatees, this is the best I've ever seen them. We got a site right on the beach on Amelia Island. The campground was Fort Clinch. There's a spot in Jacksonville Beach where you need to take a ferry to cross the river! We called this our "Christmas Cruise". I was really impressed with how comfortable our camper was for four of us. Happy Holidays! I usually view Christmas as way too much effort and money. I prefer to take a vacation and ignore it. But, as with so many things in the RV, the effort is so minimal that ... what the heck! I bought a potted Norfolk Pine from Lowe's for about $5, Jim got 2 little strands of lights for $2 each, and he had a few ornaments he saved from the house. And, you can't fit too many presents under there! It's so cute! I'm even playing some Christmas music ... Jim has at least a dozen CD's collected over the years. And, for New Year's I'm going to revive an old tradition of mine and have an 'Open-House' brunch. Or, make that an 'Open-motorhome' brunch. We'll park it at Easterlin, a local County Park, and anyone who wants to come by is welcome. It will be a sort of bon voyage party too, since we expect to be leaving town in a month or so. Well, hopefully, the 3d time will be a charm! Yep, that's right ... we went for another trip to hook up with the Datastorm installer and are still coming back inoperational. Only one of the 2 suspect parts were available to replace ours. The second one is now being overnighted to us. So, that (the receive modem) must be the problem, cuz it's still not working. It looks like it's going to work, but just never finds the satellite and locks on to signal. It's certainly not for lack of trying on anyone's part. But, we enjoyed our trip anyway. It is so indescribably scrumptious to be able to travel about and yet always be home. Today we were driving back to Fort Lauderdale from Ft. Myers on the west coast. We pulled over at a rest stop to take a bathroom break and realized that the Dolphin’s were playing our ‘arch-rivals’ Buffalo Bills at 1pm and it was now 1:15 … what the hey! We cranked up the TV antenna, popped the top on a beer and settled in to watch the game. This is the ‘cab over’ part of the RV – we call it the loft. It is the most comfy TV spot I’ve ever had in a home. We don’t have a TV per se … we use our computer projector and project onto an artist’s painting canvas! Add the 6 Bose speakers and we have one heluva home entertainment center! Well, the install went smoothly until time to load the software. The hardware presented a couple of challenges. Chris' PC did not come with old fashioned RS232 serial ports or a floppy drive. We got a USB- to- serial adapter at RS and the darned thing came with installation files on a floppy! Sure glad we got a USB floppy drive recently and that the PC has lots of USB ports. When we hooked everything up, and installed the software, the compass was not registering. Everything else looked all right and we could manually put in the compass heading. After all the testing and calibrations, we couldn't find a suitable signal. Multiple calls for tech support were not able to get us operational. Indications are a receive modem and/or a board on the dish assembly. We'll be going back for completion next weekend. In the meantime, the dish looks cool on top of the coach, and we still have high-speed Internet from Coach Connect here in Paradise. I'm so sorry I didn't take any photos the other evening. I belong to a group called Women's Executive Club. Among other things, we meet once a month at a member's home for a social. This month I was co-hosting the social with Vivien, the owner of Blue Water Books and Charts. I told people they could visit Vivien's AND my home ... no, we don't live together! Jim and I drove our motorhome over to Vivien's home and parked in her driveway for the evening. It was great. I so enjoyed having these women, some of whom I've known for many years, see my new lifestyle. The reactions were interesting - from "You've got to be kidding, there's no way my husband and I could co-exist in here!" to "Oh! you're really sparking my wanderlust ... I would so love to do this!" Whatever the reaction, I know that I LOVE it. All I could talk about with these women I 've known for 20 years is how lucky I am to have found a partner who loves the same things as I do. Jim drove the RV there and was happy to give tours to all who stopped in! So cool! And, of course, the views we had while parked at Vivien's home were pretty spectacular. The waterways of Fort Lauderdale's Rio Vista Isles. Just a few blocks from where I lived when I was in Jr. High. Hey! We've actually been acting like we live in a motorhome the last few days! 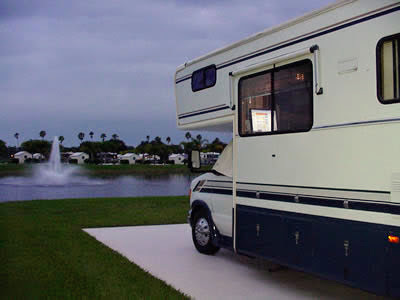 There's an RV park in central/western Florida - Riverbend - who also has Coach Connect wireless internet service - like we have here - and they needed some help getting folks connected. So, Coach Connect asked if we would pay them a visit on Friday. We left Fort Lauderdale Thursday afternoon and pulled in to John Prince park in Lantana just before dark. That is such a pretty place, I had to take a couple photos. We relaxed there for the evening, got a good night's sleep and hit the road early the next morning. We arrived at Riverbend and had a dozen or so eager students waiting for our presentation. We set up our computer and projector, but the room was too light and there was no wall to project - so we improvised and used my 19" monitor for the audience to look at. Not ideal, but it worked. Everyone was full of questions and Jim and I were full of answers. It was great. The wireless internet connection worked just fine and Jim was able to explain it to everyone's satisfaction - even though there were some system engineers in the crowd. Then we spent the rest of the day there helping individuals get online. It was successful all the way around, but one site took a while and was a little flaky. Jim gave him our number and we may be hearing from him again. One thing I realized while Jim was giving the main presentation is that so many people use services like AOL or MSN or Earthlink or Walmart for their email. I don't think they realize that they don't have to have their email with the company that provides their internet connection. I told them about using a webhost like Catalog.com to get their own domain name and email addresses and they seemed VERY intrigued. I think I should put together a package to set people up with their own domain, email, and website - probably using blogger. When we were done there, we went to a place down the road to spend the night. Riverbend is a 'Class A only' resort, so we couldn't stay there. They sent us to a place down the road called 'Grandma's Groves'. Pretty cool, camping in the middle of an orange grove! We had a very nice, traditional Thanksgiving day dinner at Jim's sister's home. 3 generations gathered, ate and watched football. Tradition is nice once in a while! Today it is 92 degrees outside according to the new indoor/outdoor thermometer that Jim bought. And, he's outside working on all sorts of projects. I think the RV is much more conducive to working on projects than the house ... the house was just too overwhelming. In a motorhome, everything is brought down to a more manageable size. And, I get to sit at the computer and do my work without thinking of all the projects I'm not doing! Here's Jim working away at taking fabric off the old couch that we took out so he can cover a cushion for the bench we have now in front of the computer. Cool. New furniture that looks like it came built-in with the coach. I'll take another photo when it's done. Thanksgiving Day: and we have SO MUCH to be thankful for!! The house closed on monday!! Yippe, hooray and huzzaaah!! We have no idea what is coming next, but we're open for it all. We ordered our internet satellite dish from Datastorm, so we will soon be able to go on the road knowing that we will have an internet connection anywhere. We will even be able to just pull off into a rest area, raise the dish, and be on the web! We are still also committed to spreading the seeds of wireless internet in RV parks. Coach Connect is the company who installed the wireless in our current park and it has been working GREAT! We are developing a relationship with Coach Connect to sell and support their services. Looks good. I really want to add photos to this blog and be like Tioga and George!! But, it doesn't seem to be an option ... they are doing away with the 'blogspot plus' where you paid to have the extra feature of uploading photos because that is going to become a free feature ... BUT, it's not in the feature set yet, and, meanwhile you can't sign up for blogspot plus anymore. A real 'catch-22'. Just in case you'd like to see the house that we left ... It was a great place to live for almost 10 years. We had lots of gatherings there ... But, 10 years is enough and we're ready for a new adventure in our COOL motorhome. We will miss the hot tub tho .. we will be partial to RV parks with jacuzzis since we had such a nice one at the house. Thanksgiving day: This seems a perfect time to start our new blog "Odie's Roadies" because we are so overwhelmingly thankful for our wonderful lives. We made a life decision in May of this year to sell our house, buy an RV and live on the road. We would make a living by setting up wireless internet in RV parks and performing other computer services. Well, the house closed on Monday of this week, we've been living in the RV in a Park in Fort Lauderdale for the last few months, and we're ready to take off! Well, it had to happen sometime, and I guess this is as good a time as any. We're having some problems with the RV. The air conditioning just stopped last Thursday. We had it looked at and determined that the problem was electrical. When we took off the cover for the breaker panel you could clearly see burnt wires ... NOT a good sign! We determined to take it to Fort Lauderdale RV Sales and Service first thing Monday morning. We have a couple other things that need to be done as well - install the Bilstein shocks, service the generator, and find a small water leak. They told us they would 'get right on it' since the RV is our home, but it still might take a couple days (and who knows how much money). So, thank goodness the house hasn't sold yet! We do have an 'almost-signed' contract on it though .. yeah! We grabbed all the computer stuff, a few clothes, all the food from the fridge, and moved back into the house for what we hope is just a couple days. The problem apparently has to do with plugging in the RV to power that wasn't sufficient. I'll see if I can get Jim to write the details. Bottom line, Jim ran right out and bought a little device that will test the line before you plug the RV in. Apparently this is something that every RV owner should have and you should never plug in until you've tested it first. OK - lesson 1 of 2,375! My only vacuum cleaner is a dust buster and it takes me all of 15 minutes to do my whole home! 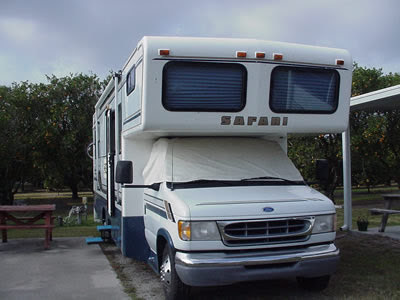 Our 30 foot Safari Class C motorhome has everything we need and nothing more. It's so cozy and practical and life in the RV park is a social experience ... a real community. We are settling in to the RV life. 'Settling in' wasn't exactly our plan ... the idea is to go on the road ... but, we take life as it comes. Right now, while the house is still on the market (see it here then click on the listing for Royal Palm Acres) it's best to stay put and keep servicing computer clients in our current business. So, we live in an RV park in the middle of Fort Lauderdale. I want to write a little about what life is like: Yes, we have less space than we did in the house! That's an absolute. But, what did we do with all that space we had? We cluttered it up! I'm actually looking to the RV to teach me the concept of 'a place for everything and everything in it's place'. I have never learned that. In fact, I had a philosophy that everything should be out and in sight. I preferred filing systems that were bins hanging on the walls rather than filing cabinets. If I put something where I couldn't see it - I lost it - plain and simple. Out of sight, out of mind. 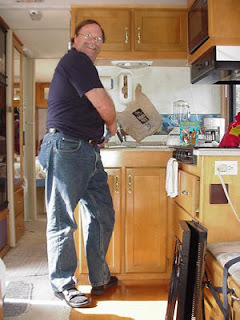 In the RV it is essential that everything have a place and things be kept in their place. We still leave a few dishes in the sink, and I leave the toothpast and makeup on the small counter around the bathroom sink but, when we start driving, everything MUST be put away. So, we vow to drive the camper at least once each month even while we are 'settled' so that we keep in practice of stowing everything. Hopefully, we will drive somewhere for at least an overnight jaunt, but any kind of driving counts. This month we drove to the workshop of our friend who built our custom cabinetry for the computer, printer, and entertainment system. We would have taken at least a weekend trip except this month we had a weeklong dive trip. We were on a boat in the Bahamas with our dive club Kayuba. The weather was perfect and we had 3-5 beautiful dives every day. You can see photos here. Hey! August 1 and we're taking our first road-trip. Well, the first road trip for me and Jim. I took the camper the last weekend in June with Mom, Chris and Emily and went to Jonathon Dickinson park. Before I got too comfortable with Jim doing all the driving and setting up, I wanted to do it all myself, just to know I can. It was great. There wasn't anything I couldn't do, although I'm sure I was more tense than Jim is driving it. After no more than 2 hours, I felt pretty exhausted. When Mom asked me, "Well, what are you going to tell Jim? Are you going to tell him that this is piece of cake and you'll do all the driving now?" I said .... actually, I think I'll say "Been there done that, don't need to do it again ... here's the keys." So, this is really the first time doing real vagabonding!! We have been living in the RV full time for the entire month. So, when I would think about what we needed to go away for the weekend, I had to keep reminding myself "Everything will be with us! We're taking the whole house AND the kitchen sink." It is SO comfortable riding and it is SO comfortable living in. We just LOVE our RV. We're going to visit my Dad in Dunnellon, and we wanted to check out another internet option for RV parks. 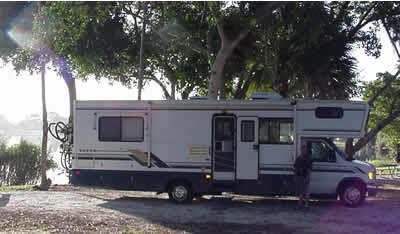 We found an RV park in Ft. Myers - Shady Acres - and we're using their wireless connection - Linkspot - right now. Left Ft. Lauderdale at 1pm on Friday - got into Shady Acres at 4:15 - 132 miles and we stopped at a rest stop on Alligator Alley for lunch and to wait out a storm. So, not surprisingly, the internet connection didn't work last night. So, we used the cell phone. Hooked it up to the USB port and dialed into the internet piece of cake. Cool! Of course, it was connected at 14,400 - pretty painful, but at least we could get our email. We went to the office this morning to see if anyone could help us. We said, 'just check that the internet is up on your computers here'. Linda replied "Oh, I don't have access to the Internet, just the owners have that. whew! Jim got the Linkspot guy (Mark Kaplan) on the phone and he told him some IP address to type in manually and got us on. Meanwhile, Jim asked for literature to be sent to Paradise Island - and inquired as to job opportunities. He was told that they're looking for someone in Florida! Another new experience! Cooking dinner and trying my damndest to only cook what we're going to eat! We're spending our second night in "OhBoy" in the RV park. Our first night we shared a cookout with the other 'workcampers'. Fun. Tonight I went to the grocery store. (It is very obvious that we want to have a car for this adventure - so, gotta tow) I only bought a few things - no more full carts - two rolls of toilet paper, not the economy 8 pack. Then I came home (to OhBoy) and only put as much linguine in the pot that I thought we would actually eat. I did a pretty good job actually - no left overs. I even made the salad in our individual bowls instead of a big salad bowl ... less to wash too! Jim spent all day working on the wireless network for the campground. All is going great! I'm typing this on the laptop in the RV. Not only does the internet connection work ... it's really fast. Works good. There are a couple other workcampers that we've met and look forward to seeing more. Cool. I spent much of the day back at the old house cleaning up some more. We listed the house on Thursday for 209,000. Other houses in the neighborhood are up for 259, 269 and 213 - so we have a pretty good chance of selling quick. Some people came by unexpectedly today tho ... it was embarrassing how messy/dirty it was. Yep! Time to move! Oh boy!! The RV is in our driveway. It's been there for a week now. I put photos on our web photo album. Go to JimandChris and click on 'most recent photo albums'. What a luxury to have the time to sit and dream and plan what we want in it. Ray came over yesterday to discuss custom cabinetry for the overhead area and the office area. I hate to lose the couch, but we HAVE to have a stationary, always-on computer area. After several iterations in Jim's and my dreaming, I think we've come up with some pretty good solutions. We realized the computer chair was going to be a problem. If you put a regular office chair in there and had the desk against the window - you'd roll over the edge of the cockpit any time you backed up. hmmmm Ok, get one of those 'knee' chairs. Ugh, they really aren't very comfortable. Ok, put the desk against the back of the driver's seat. Now there's not enough room for a regular chair and have the 2 filing drawer/bench. Ok, just sit on the bench. hmmm not very comfortable. Ok, put a stadium seat on the bench. kinda tacky How about a seat made for boats? We went to Outdoor world and looked. Hey, this could work. Then we still have loveseat size bench AND good comfy chair for computer work all in the alloted space! Then I realize, 'who needs a boat chair?' Just take the wheel aparatus off of my current office chair (which I love) and voila! All this thought process took several days and several times just sitting and dreaming in the RV. We're going to end up with something pretty cool! Now we have to sell the house. I had some cleaning people come help for a couple hours, then I continued for the rest of the day and part of the next. It's pretty clean now. And landscape people are coming today to clean up the outside (for $500!!) Then we can call the realtor tomorrow and get going. Emotions have still been running pretty high. Afraid that we're not doing a smart thing. How are we going to make a living?! Jim's been real busy lately with clients that have computer and network emergencies. We can't leave them! So, that means living in the RV in a local park. Is that really what we want to do? What good is having an RV if we can't take the time to travel? Well, I have 2 chargeable website jobs now. But how am I going to get more? I still need my quotes to give me the pep talks. Here's one: "Worry does not empty tomorrow of its sorrow; it empties today of its strength." And : "To be scared out of your senses is sensible. To be comfortable is suicidal." Tom Peters Alrighty then ... Let's Go!! I am having a horrible time throwing stuff out! What a psychological dillema! I am determined to clean out my life, start fresh, only what can fit in the RV is coming with me - the FREEDOM will feel SOOO good. Then I open a box (hoping I can throw the whole box away) and I find grade school report cards. aaaaaarrrrrggghhh I've kept those for sooo many years ... only to throw them out now? Or how about good 3 ring binders? Maybe I can get myself to toss the contents, but I paid good money for those binders, I can't just throw them in the garbage?!?!? ....... I need a drink. Omigod ... we've paid our money ($28,000) for the RV and should be picking it up in a couple days. We are being mighty trusting here, but it's the only way I know how to be. I love how some people think we're totally nuts ... and some people are envious. We are going to have to learn to live with a lot less stuff. But, that's exactly what I want to do! The campground trade show came and went and Hialeah Meter didn' t return Jim's phone calls :-( oh well. Things always turn out for the best. I took the flyer I made and stopped by Paradise Island RV park (the one we plan to move to anyway) and asked if they were interested in providing high speed internet to the campsites. Yep! They were very interested. So Jim went and talked to them for a while and they're even more interested. We proposed a 6 month arrangement where we get to set up the technology, tweak it and support it, in exchange for free rent. I think that's a real win-win. Can't wait! I'm trying to put together some kind of flyer for Jim to take with him to the RV and Campground Trade Show next week. He'll be in Hialeah Meter's booth with them and promoting services for campgrounds to offer high speed internet access to their customers. 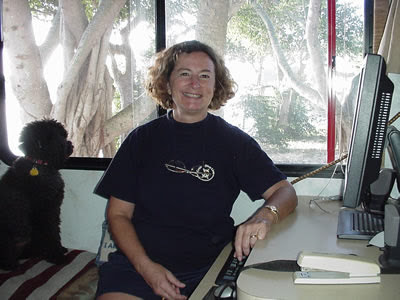 In looking for some graphics to use, I stumbled across a site for RVers that has the best explanations I've found yet on the variety of ways to connect to the internet from the road. Buy an RV from eBay! Yep, let a couple of days go by and there's too much to say. So, I figure "I'll make a weblog entry later" ... and you know what happens then. Anyway - getting reenergized this morning. We actually made a bid for an RV on eBay! As one friend said "That takes guts!" Well, it's fun having guts. I've been watching RVs on eBay for several months, but didn't ever think it would actually work out. Most of them are in Texas, California or something like Michigan. But this one is in Tampa, it's a high-quality make (from Monaco Coaches) and it meets the specifications we have settled on - so we Bid! eBay is fascinating. The RV was listed as an auction item with a 'buy it now' price of $33,500. The seller's email was also listed so I could ask some questions. It occurred to me that "what's to prevent us from circumventing eBay if we're in direct contact?" I think the answer is simply - someone might report it and then you'd be blacklisted from using eBay. Buyers' and Sellers' 'ratings' are highly prized. You don't want to do anything that would get you negative feedback. Anyway, we put a bid in of $28,000 and were informed that we had not met the 'reserve'. Reserve means the hidden price that the seller has said is their minimum acceptable bid. Well, I emailed the seller and told him "I know we didn't meet your reserve, but thought you may want to consider it anyway" And! He accepted it. Now I've asked that the terms include "we can opt out of the sale if we inspect it within 7 days - and lose a $300 deposit. So, we'll drive up sometime in the next week and, hopefully, drive our new home back! We would also like to stop at Lazy Days and have them check it out and possibly sell us an extended warranty. Two more people today talked about me doing their web page. I've got to get going on this! Had an appointment this morning with an artist to help make our own web page look good. He got excited with the idea of a 'comic book' theme. I kinda like it too - but only if it can also be elegant and professional as well as fun. I certainly couldn't accomplish that, but maybe he can. So, I'm looking at other sites and it's amazing how different 'comic-books' can be. I like the callout graphic at comics.com, I'm not sure if I like the green color. I don't like the all caps and stars at DC Comics or the angry/mean look of the superheroes. I like the callout alphabet at this site. I kinda like how Garfield is standing over the top of his web page here, and also how he's coming out the the computer. Oh, and there's a drawing of garfield's buddie Odie here. Notice the nameplate that he's standing on, I like that. On this page there's a font I like - the button 'Cartoons'. Hmmmm - I think maybe the Archie comics has about the right flavor? On a totally different note, here's a website that I like because it is so clean and simple, yet so full of good stuff. It's the South Florida Underwater Photographer's site. I think a main difference between them and us tho - is that it's pretty clear what they are there for. Guld Systems needs to do a lot more explaining. Or do we? The hardest thing is to make something simple ... maybe that is what we really need to work on. Great day today. A realtor came to look at our house and she told us a realistic price that would easily pay off all mortgages and loans and give us at least $75,000 in our pockets tax free. That means we can buy an RV and a tow car (both used) and put $30,000 in the bank. That works for me! We should certainly be able to live on a lot less money. So, if we can stick around and do the same amount of work for a while - we can save some more - while we learn how to make a living from the RV. Jim is now leaning toward establishing wireless 'hotspots' as the way to go. Sure seems like a win-win-win proposition to me. We incur all the expenses to establish a high-speed wireless internet connection at a campground. Campers with their laptops get to connect to high-speed internet and we automatically collect a percentage. The campground owner gets to advertise that high-speed internet connections are available and draw more customers. We continue to collect the connect charge percentage for the foreseeable future. I'm so excited I can hardly stand it. The realtor says that our house will sell quick - so we'd better be ready to go when we put it on the market. Perfect! So, we buy the RV and park it in the driveway. We outfit it with all our stuff. When the RV is completely stocked ... that means everything else in the house has to go! I still think 28 foot class C is the way to go. A little small for living, but still manageable for driving. The best compromise. Just be sure it has a full bedroom and a place for an 'office'. Our work phone number needs to transition to our cell phones. And, I'd like to receive my email on my cell also - for those times when we don't have high speed internet available. Fear. That gnawing feeling in your stomach when you think ... "what are we doing?" "why are we doing this?" "Why are we getting rid of our comfortable home?" The answer is "why not?" We are so conditioned to seeking greater comfort in our lives ... to work hard and make money so we can relax and take it easy. Why do we want to 'take it easy'? What fun is that? It just breeds lethargy. The more you 'take it easy', the more you lose your ability to be active. It's easy to get so complacent that even going away for a weekend seems overwhelming. You hear so many times that folks at the end of their lives have only one regret ... that they didn't take enough risks. Life is for living. Why are we doing this? Because we want to. It really can be that simple. We don't have to wait for external factors to push us into making changes. We can be proactive. Ok, I feel better now. I just needed a pep talk. Another good website with lots of info about the RV Lifestyle. I can see that these folks are retired but still making some income by writing books and giving seminars. They say their most popular seminar is about receiving your mail, paying your bills etc. while on the road. I'm sure it's a no-brainer that books and seminars on using your computer on the road won't be far away! OK, so Jim works from our RV being a campground computer hero and connecting them to broadband internet connections ( see CNET article on Broadband choices) What am I going to do? I will have some clients that I support over GoToMyPC - but that's really not much. I'll continue to build our website and join affiliate programs. That's still not bringing in much income. What are people asking me for without my even trying? Websites. They don't know how to do it ... I do. They want me to do it for them. Register their domain, set up a hosting account and a couple emails, build a simple website, and be available for making changes. It's not a very novel idea for a business - seems like everyone and their cousin is into it - but it's something that people want, and are willing to pay some money for. So, I need to pursue it more fully. And, with hosting sites like catalog.com at $25/yr - people's $500 budget can go to me - rather than to the host. Yes, I felt really comfortable in Rusty's RV, and it DOES look like it's in great shape. Rusty and her husband Lee wanted to chat about their life and all sorts of stuff. It was good to just sit in the camper and absorb the feeling. Something that hit me was how inviting the bedroom area loooked ... no I didn't feel like using it right then, it just seemed so clear that a separate bedroom area was important for a full-time living space. I didn't want to get rid of it in favor of an office. hmmmm - so, can the couch come out and make an office space? There's another site out there similar to Lynda.com - maybe I'll try that next. It's called Apex. Same ideas with the movies and the $25/month. They have more variety in their titles - lots of Office apps like Excel, Word and Access, lots of Photoshop and even Adobe Premier. They also have Dreamweaver titles all the way up to and including programming with .asp, asp.net and cold fusion. I don't see an affiliate program tho. I am hooked on Lynda.com! It is a web-based training site that uses Quicktime videos for training on Dreamweaver MX and many other graphic-related products. I am finally starting to get somewhere with designing our website www.CampgroundComputerHeroes.com. I also have www.guldsystems.com redirected here. It's watching the training movies at Lynda.com that has given me the capability to work with the website. I have lots of other work to do, but I find myself sitting down at the computer and watching another movie! They have a complete "Learning Dreamweaver MX" course, as well as an "Intermediate Dreamweaver MX". Each course is broken down into 5 - 15 minute segments, so I can go directly to a topic I need to work on - or - I can settle in for a group of lessons. I've been doing both. I am watching the complete course for both levels AND, as I work and have questions, I am reviewing some lessons I've already watched as well as jumping ahead to something I want to know. The material and the presenters are wonderful! They speak clearly and specify every detail of what they're doing, yet they don't 'talk down' to their audience. The examples they use are very intelligent and the web pages they create are very nice looking - so, I am learning something about good design as well as the mechanics of using the program. And the value! Wow! These movies started out as video courses produced on CDs. Each course costs about $180 on a CD. But, you can 'subscribe' to the entire library on the web for $25/month. What a bargain! I find myself thinking ... gee, if I were living in our RV now, I could spend ALL my time at the computer learning stuff cuz I wouldn't have to get up and do the laundry ... no house to clean ... no clients to visit. Ha! That's not what RVing is supposed to be about is it? It's supposed to be about living a rougher life than in a house. Back to nature and all that. Not having all the same comforts or work capabilities as at home. But, with a computer and some kind of high-speed access, it's just not true anymore. We're taking SOHO (small office, home office) to SORVO! hmmmmm ... I wonder how they decide what ads to put on this blogspot website? Could it actually be coincidence that put a link to Broadband, Mobile internet and Portable Satellite Internet at the top of the page for THIS blog? Wow ... things just keep falling into place. Jim had an appointment today (arranged by Tom F) with a company that installs electric meters in RV parks. Jim pitched the idea of providing fast internet access thru the powerlines and they liked it! We gotta get our website going good, make business cards and brochures for this new business, cuz this company is going to help get us started! I've spent most of the day working on web stuff. I'm still so uncomfortable with Dreamweaver. But, I found a GREAT site to help me. It has training movies specifically on Dreamweaver MX and they're wonderful. Really helping to get me over the hump. This week, while Jim was at a client's office, he got to talking with the admininistrative assistant there. Come to find out she owns an RV park near Okeechobee AND she has a 28 foot class C RV for sale!! We were looking at 24 footers, but this might be good. It would cost over $60,000 new and she is asking $32. It's a 2000, I believe, they are the only owners and they haven't used it much. We're going to drive up to look at it tomorrow. Gotta write about website stuff too. We've hired a graphics person to help us make guldsystems.com more professional looking. His first step was to outline the Site Map. Then, he kinda liked our hero graphics and said he might be able to design something around a comic book theme. hmmmm, we kinda like that. But, can it still look professional? And, I want to be sure to somehow incorporate our affiliate links in a way that works also. Maybe just a page of 'links' of all sorts of stuff, just categorized. And, could I use our Guld Systems web site for a lot of historical, memorobilia type stuff that I just want to have somewhere? We threw more stuff out this morning and I'm hesitating over Computer Savvy memory stuff. .... Take pictures and put it on a website! ... Check out Dan Bricklin's web site. Lots of personal and computer industry history there, in addition to his weblog. I think I'd like to do something like that. I find myself looking around the house and thinking about what it would really be like to take off. TVs, stereo equipment, framed photographs, shelves and shelves of books and memorobilia. Old clothes, not so old clothes. How do you get rid of it all? What would it feel like to not have it? While researching the ways that RVers are connecting to the internet I don't want to forget about Joline's sattellite connection. She uses www.motosat.com. $5500 for purchase and installation, $80/month for internet service is what she says she paid. Yesterday I registered the website: CampgroundComputerHeroes.com! We've recently been promoting our image as Computer Heroes with a great little cartoon image. See www.guldsystems.com. And people love it - I got a call for MS Access help from a client the other day - she had to give a report to her boss that afternoon and she couldn't figure out how to do it. "Here I come to save the day!" She said she'd get me a cape. This morning we visited a local RV campground to check out what they offered for fast internet connection. Interesting. Each camper who wants DSL has to sign up with BellSouth individually. They can contract on a month to month basis, but obviously this doesn't work for the one or two night visitor. I'm a vagabond at heart. As an only child I learned to be self-sufficient. My family traveled a lot and I grew accustomed to a life of change and challenge. I continued to travel after I left home. At my 10 year high school reunion I got the prize for coming the furthest and for having moved the most times since High School! At my 20 year reunion I got the prize for traveling the shortest distance to attend the party. You see, I had since moved 'back home', started a business and become a very stable, workaholic, 'pillar of the business community'. That lasted about 14 years till I got burnt out and sold the business. Then I got married, inherited a stepson and became an even more stable 'pillar of the home'. Was the vagabond life just a figment of my past? Is there any way to scratch that itch on my feet? My husband and I often speak of our 'someday' plan of buying an RV and living on the road. We've rented one a few times and just love the way it feels to go wherever we want and have our home with us wherever we go. We are both computer consultants and know that there are multiple ways to make a living these days using your computer - and it doesn't matter where you are as long as you have a good connection to the internet. So we spend some time honing our web-development skills in between visits to clients putting in our billable hours. And we browse the RV websites and dream about our 'someday' plan. A week or so ago, my husband casually mentioned that maybe he could help campgrounds with installing DSL connections and making them available to individual campsites using powerline technology. That sounds great! Don't figure out how to make enough money to support a life on the road. Use the fact of being on the road to make money. Boy! Did this start something in my head. A paradigm shift. I had been thinking that I was just joining the evergrowing crowd of people who were taking to the road in their RVs. We were going to face overcrowding and rising costs of a fad. Now I'm thinking - "Find a need and Fill it" - People taking off in RVs IS a growing trend. And lots of them take computers with them. Jim and I have 20 years experience supporting computer users. I'm sure we can capitalize on this if we just do it. An RV show came to Fort Lauderdale last weekend and we eagerly attended. We had always been partial to the Roadtrek camper van. We thought that we wanted something small. The Roadtrek still looked good but when we walked inside an Itasca 24 ft. class C RV - we felt at home. This is something we could live in, not just go on trips with. When Jim mentioned that the bed in the back could be taken out and put desks, computers and an office back there, I was hooked! Last Wednesday we met with our 2 friends we call our "Board of Directors" and told them a little of our 'someday' plan. They asked, "what is your timeframe?". hmmmmm .... well let's say 2 years. But, I've been thinking about that question almost hourly ever since. What are we waiting for? If we sell the house, we could pay for the RV and have some cushion for living for a while. We could even just live in the RV at a local campground while we still service our local customers and learn about the campground market. My little vagabond heart is just racing with the possibilities.